A scissor lift is a motorized vehicle with a sturdy platform that can only be raised straight up into the air. The platform cannot be moved horizontally as with other types of aerial lifts. Scissor lift types include fixed, mobile, electric and rough terrain. Environment: Will the lift be used indoors or outdoors? 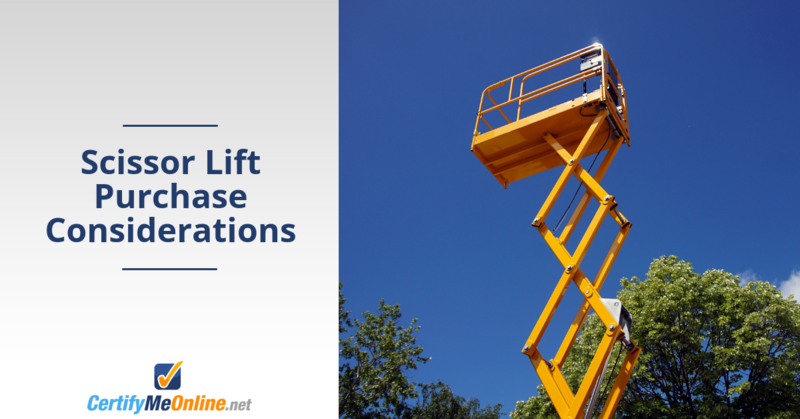 Jobs: What type of work will you be performing with the lift? Emissions: Does the work area have strict emission codes? Terrain: Is it smooth or rough? Can it safely support heavy equipment? Work heights: What is the maximum height your scissor life will need to reach? Weather: What are weather conditions like on your work sites? Frequency of use: How often will you use the scissor lift? For how long? Safety features: What safety features, such as emergency buttons and safety bars, will you need for maximum worker safety? Load capacity: How much weight will the scissor lift need to support? Clearance: If used indoors, what is the clearance when working in aisles or other narrow workspaces? Buying a scissor lift is no small expense. The bigger they get, the more they cost. After the initial purchase price, you still have the cost of training all workers who will use the lift. You also have to account for maintenance labor and replacement parts. Fortunately, there are ways to minimize the total cost. Buying used rather than new can save a lot of money. The downside is you don’t get the warranty of a new lift. Plus, a used scissor lift has a shorter life cycle. But if the lift has been well-maintained and you only need it for light to moderate use, buying used might be the right decision. You can also rent rather than buy. This option works well if you only need the scissor lift for occasional work. Renting also saves the cost of storing and maintaining the lift, and the cost of transporting the lift to the job site. When renting, the rental company will deliver it for you. On average, there are 26 deaths a year in the U.S. due to aerial lift accidents. In many cases, they result from operator error or negligence. If you buy a scissor lift, training and certification for employees is not just an OSHA requirement. It’s the right thing to do. You owe it to your employees to provide a safe working environment. With aerial lifts, that means approved training and certification for all who work in and around them. Scissor lifts will often have more than the operator on board. Everyone on the lift should be trained on aerial lift safety. Keep in mind that the American National Standards Institute (ANSI) recently released updated standards for aerial lift safety and training. When you send employees for training, make sure to use a company that trains and certifies to the new standards.